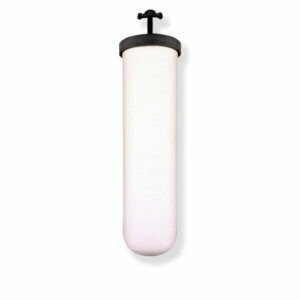 *This is for the Berkey Earth Filters or White Ceramic Filters(Super Sterasy) only. *If you have Black Berkey Element Filters(regular filters come with the unit), then you need to get PF-2 instead. Number of PF-4s in the bottom chamber must match the number of Berkey Earth Elements or Super Sterasyl Ceramic Filter Elements in the top chamber. 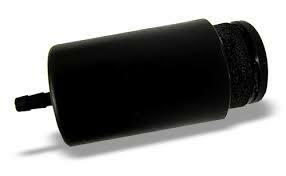 *This is for the Berkey Earth Filters or White Ceramic Filters(Super Sterasy) only. Not for regular black filters come with the systems. No five stars because I primed these much more thoroughly than required in the instructions, yet when I installed them the water was still cloudy and some grey residue was in the bottom of my Big Berkey. I had to refill and empty three more times on top of the first recommended time, and in addition to extra rinsing of the elements themselves. BUT once that was done, they’re working great and the water tastes great. A sample of the Berkey water was submitted to my State Env. Lab. The results showed a value or 0.40 MG/L Units. We use our City water to fill the Big Berkey. Our City water’s fluoride level is 0.87 MG/L to 0.96 MG/L. I got my Berkey because my village adds fluoride to the water. Removing it myself seems to be the next best thing since I have not been successful in getting them to stop. 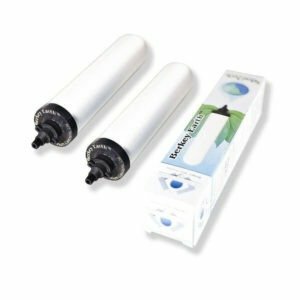 I looked into several water filter options and this was the most affordable and realistic for me. They are a b**** to prime, but I’m so glad to have them. Flouride and whatever other chemicals in the tap are no good for you or your kids! Anyway, just prepare to prime them under high-pressure water flow for a good long while. Like maybe even up to 20 min. For starters people have been complaining about the white film in the water, which is undeniably there when you first install them (even after priming). I have been using these for about two years and it doesn’t matter how much you prime them, this will always happen. I have a Royal Berkey and I have to run 4 full filters of water through these before it goes away. My town as high levels of fluoride in the water and so I use these filters to lower the level for my children’s drinking water so they don’t get discolored teeth from the drinking water. It occurred to me that maybe I should be changing them more frequently because of the high level of fluoride and the customer service person from Berkey told me that that was NOT the case and the level of fluoride did not matter. This didn’t make sense to me so I got the water tested: once from the tap, once from the filters that were 5 months old (the customer service person told me I should change them after 8 months BTW because of our level of usage) and lastly from a set of new filters that had been cleared of their white gunk. The results were that our tap water was 2.5 (it should be under 2 to prevent damage to children’s adult teeth as they are growing), the 5 month old filters had only reduced it to a 2.2, and the new filters reduced it to a 0.5. From these results it seems obvious that the level of fluoride in the water affects how long the filters will last. I’m going on 2nd year ordering these filters to deal with the filtration of my public water in my home. I’m happy with the water quality so far. My whole family loves drinking our purified water. I personally add Pink Himalayan Salt to my filtered water as this raised the pH of the water and provides over 84 trace minerals our bodies need. I don’t need soda, coffee or sports drinks. This is perfection in simplicity. I must say that I am pleased with the shipping, quality and durability of ALL my Berkey products that I’ve purchased. I’m a Berkey customer for life. A The PF-2s are intended to remove fluorine and arsenic. However, I do suspect that they will trap some of the pollutants that get pass the black filters. The PF-2s just have a 1000 gallon lifespan, while the blacks have a 3000 gallon lifespan, so don't rely on them for any thing but fluorine/arsenic removal. Can you dig it? 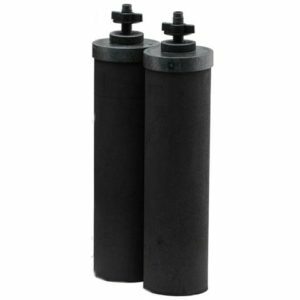 The Black Filters remove a very high rate of chlorine, pesticides and pharmaceuticals. Q We have been seeing kind of opaque things in water in glass teapot.Do we need new fluorie filters? A I would say yes, but you can always call Berkey. They have always been helpful. Q If you dont use the filter within 2 weeks do u need to get new filters to avoid mold? A If you've not primed them, there as good as new. If so I'd check with the manufacturer. Good luck ! Let us know what happens please. From: Another owner of this product..
Q I was able to prime the first filter but it's taking forever (+30min) on the 2nd filter. All this white sandy soot keeps coming out. Is that normal. Q With these filters in stalled in a Travel Berkey how much capacity do I lose in the lower unit ? A This is just an estimate, but looking at my filters, I think you might lose about half a gallon, or a third of its capacity. The speed at which water is cleaner will be a LOT slower, but it's well worth it. Also, make sure you follow ALL of the instructions that come with the PF-2 filters while installing. The "seasoning" process is a bit more complicated than with the black filters. Finally, make sure you do not put hot water into the top, as the PF-2 filters tend to heat the water as it passes through. Q Can the old filters be recycled? A Partial recycling is possible but not so easy. The white shells are polypropylene which can be recycled. The filters inside are not recyclable. So would need to disassemble the filter to be able recycle the shell. Q Are these filters 100% Berkey manufactured? or are they produced elsewhere? A The filters I bought here are exactly the same as the ones that came from Berkey when I bought the unit. As to where they are produced, I cannot answer the question as there is no indication of where either of them were produced. Q i have been noticing more sediment in my water since i have installed these fluoride/arsenic filters. could this mean i didn't prime them enough? A Yes, you need to prime them really well. It will take a few weeks of use to completely run off the filters sediment particles. A bit of inconvenience in the beginning. Q I've done 20 seconds of priming three times now and i'm still getting cloudy water. it's getting better though. is this normal? sheesh! Q Do i need to put floride filters on each black filter for my berkey? or will 2 fluoride filters and 4 black filters be sufficient? A It is recommended to put them on all 4. Q Why do you need a 3 or 4 year Protection Plan for filters that are replaced every year on average? Q How do I know if the filters are used up? Aside from counting each gallon I run through it? A I'm not really sure aside from having it tested, possible by the taste. A Try repriming the white filters. It depends on how much water you filter through them, and what size Berkeley you have. Q I am having to prime my fluoride filters every week, because the berkey stops filtering. These are relatively new. Any suggestions? A Please make sure they are only on 8 rotations. Also, contact the dealer you bought it from. Q Did you have the cloudy film issue? Please reply with the seller you purchased filter from when you answer, to assist the rest of us. Thanks! A I don't remember having that issue. I think if you follow the directions for priming, you shouldn't have any problems with cloudiness. Q How can I flush or prime the filters if I am in the field and have no water pressure? Do I need to? A You will need to have something that creates water pressure in order to prime the PF2s. It doesn't have to be a faucet, but it has to create pressure. Q Does this come with a priming button? If it does, does it work on the black filters as well? Q Dear buyers: Does the metallic taste go away? A Do you mean after the filters are installed? The filters make the water essentially tasteless. They work great. Q What is the manufacturers recommendation for replacement time? Q I've primed these filters three times now, each time they make about 1 container of water before filtering grinds to a stop. Are they faulty? Q What is the solution if, after buying the flouride filters and flushing them, they stop working (no water gets through) after a month? A Never had that problem...try flushing them again....maybe that will work. Q I have a Berkey but not flouride filters ..do these replacement filters have all parts needed to install or do I have to buy first ones from Berkey? Q Is there a hand-operated primer for these? I bought the primer for the black filters thinking it would work for these as well but apparently not. A No. Simply rinse them until the water runs clear, indicating they are ready to install. 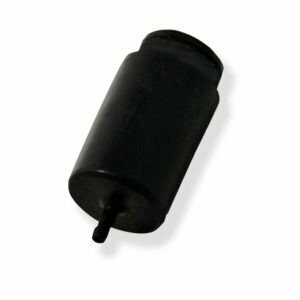 Q these are listed as replacement filters. Can they be connected as shipped onto my existing black Berkey filters? A Yes! You will need to run water through them first. There are instructions with the filters. They thread on to the bottom of the black charcoal filters. Be careful to not thread them too far. Again, they have instructions. Q The water drips out of 1 filter and comes out in a strong steady stream in 1 filter. Why? did I puntcure the one filter by screwing on too tight? A Only guessing, but I'd say that may be it. I seem to remember the directions were very specific about the number of turns when tightening the filters. Mine drip like they should. I figured if they were going to be that specific I should be too. Sorry for your troubles. Q Is it unusual to have to prime PF-2 filter multiple times? A You should not have to. However, if you find you have to, we recommend performing the shake method outlined in your instruction booklet. Q I screwed my filters on all the way, i looked inside the filter after realizing only 8 turns. how do i know if i have puntured the screen/filter? A Seven turns, sounds like you punctured it to me? 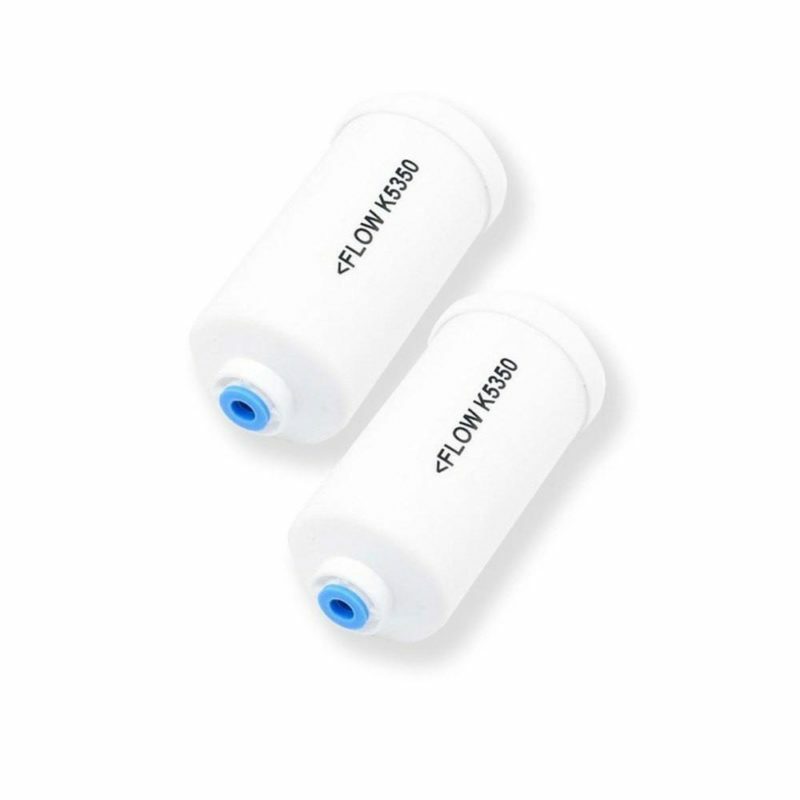 Q Will these fit an older big berkey sscf-9 9-inch ceramic replacement filters? the ends look different. or do i need to buy the newer black filters? A When I bought my new PF-2 filters I did have a problem with them fitting onto my white ceramic top filters. I don't know why but they would not meet the threads. So I too a pairing knife and trimed them until they fit. Now all is well. I do not own the black filters so I don't know if they fit properly or not. Q The flow arrows on the side. Do they need to point down for installation? A Hello , yes it does it indicates the direction of the flow of water...cheers. Q After cleaning my black filters my water flow, slows down quickly. does this mean i should get new floride filters? are they clogged? 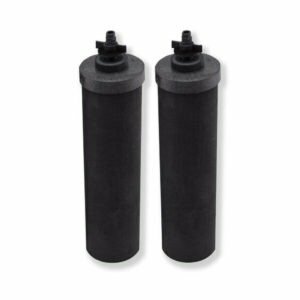 A The black filters should keep the PF-2's from clogging, proper priming of both types of filters is important and could show the symptoms of what your describing. You may want to revisit the way this is done. Because of the maintenance you have performed partial air binding is a good possibility. Q Can anyone tell me if there is a brand name or any identifying numbers on filters? Q I will be using the two food grade plastic buckets. I understand the pf2 mounts to the base of the black filter, in the upper or bottom bucket? A They attach to the end of the black Berkey elements. Q Why does my water still taste funny? A That's really odd because our water taste the same as before we installed the fluoride filters. I think the Berkey water taste great, we are very happy with our unit. Q Will these shower filters fit with your massaging shower head? Will they fit with any other massaging shower head? A I don't think these are for a shower filter - they are for the water purifier. see full description before you purchase them. I have no experience with their shower filters, sorry. Q Are the flouride filter issues still present - oily film on water, white residual substance and leak from the top? Thanks! A I had it too. No matter how long I flushed the white filters and I bought them directly from Burkey. Also, my kidneys hurt from it. Q Howoften should both the black filters and white filters be replaced? A Black filter about 7 yrs. White filter should be changed once a year as they do the heavy lifting (chemicals).